Production Grand Modern sforzando is a high-quality piano sample library for the FREE Plogue sforzando consisting of four stereo microphone perspectives and over 21,400 samples of a Yamaha C7 grand piano recorded in a world-class recording studio. Production Grand Modern sforzando contains the same Modern Gold 24 bit 44.1 kHz samples from the larger Production Grand without the need for the expensive Kontakt sampler. 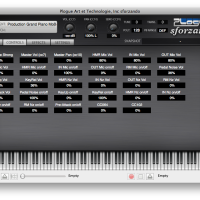 Production Grand Modern sforzando is great for those that want the same sound quality as the Kontakt version, but don't mind the minimal interface of Plogue sforzando. For complete details, audio demos and manuals on Production Grand, please visit the Production Grand products page. Production Grand Modern sforzando is ideal for Studio Production, Stage Production, Film Score Production, Performance and more! Format: FREE Plogue sforzando! No Kontakt or additional paid sampler software required! Note about file size: Production Grand Modern sforzando samples are provided in FLAC format. FLAC is a loss-less file format meaning that it will sound exactly like the uncompressed WAV source files from the sampling session but take up less than half the disk space with no audio quality degradation. Production Grand Modern sforzando source sample size before compression is over 60 GB! The digital delivery size is just over 22 GB. 1. Hammer Microphones: I’m a big fan of hammer microphones. With the hammers recorded you will get plenty of attack and a more aggressive sound. 2. Inside Microphones: This is the sound most people associate with piano recordings. 3. Outside Microphones: Just outside the piano we used really expensive Neumann M149 modern tube microphones. The engineer called these the “Golden Sound” microphones. This microphone pair has a classy sound and a more balanced tone than the inside and hammer microphones. 4. Room Microphones: We used AKG C414s on the rooms. The AKGs sound true to the piano’s tone in the room. Immediately after purchase, download links are provided by email. The download is in 13 parts. Each download link is about 1.9 Gb in size. Total file download size is approximately 22.6 Gb. Only download three links or less at a time to avoid file corruption on download. Download times depend on internet connection speed. 23 GB of free hard drive space. 8 GB RAM. Fast 7200 RPM hard drive or a solid state drive. Solid State Drive or Raid Drive recommended for best performance with 3 or more microphone perspectives active at one time. *60 GB represents the fully uncompressed library with 24 bit 44.1 kHz samples. The files are delivered and usable in FLAC lossless compression format that compresses the samples from 60 GB to 22.64 GB with no audio quality loss. ***NOTE*** Production Grand Modern sforzando pushes the the limits of what sforzando is capable of doing. It takes longer than most libraries to load, but still takes much less time than classic hardware samplers used to! You will need a fast computer to get the most out of this library! MAC users have experienced better performance than PC users. If you are a PC user, it is strongly recommended that you have a solid state drive, plenty of RAM (12GB or more) and a modern fast computer. Any MAC from 2011 and newer meeting the minimum requirements should have acceptable performance. All tests on MACs with solid state drives showed good performance or better. Performance results will vary from computer to computer based on configuration and CPU usage. There are memory-saving presets included. Production Grand runs best with Kontakt (a commercial sample player), but the sforzando edition sounds just as good for those users who do not own Kontakt. Production Grand Modern sforzando is a massive piano sample library, but it is worth the size and load times! 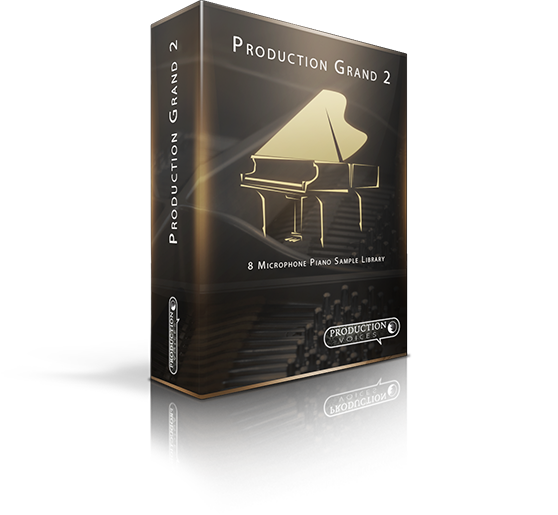 Production Grand Modern sforzando is upgradable to the full version of Production Grand for $199, should you purchase Native Instruments Kontakt at a later time. If you are a Production Grand Modern sforzando registered user wishing to upgrade to the full Production Grand, please contact support and request the upgrade. What is the difference between Production Grand Modern sforzando and Production Grand? Production Grand Modern sforzando only contains the first four of eight microphone perspectives of Production Grand Gold with 24 bit 44.1 kHz samples. Production Grand contains eight microphone perspectives and two additional sample rate options: 16 bit 44.1 kHz and 24 bit 96 kHz. These sample rate options give flexibility in live performance or audio production. Production Grand, compared to Production Grand Modern sforzando, was built with Native Instruments Kontakt in mind and takes full advance of Kontakt’s interface, controls, features etc. 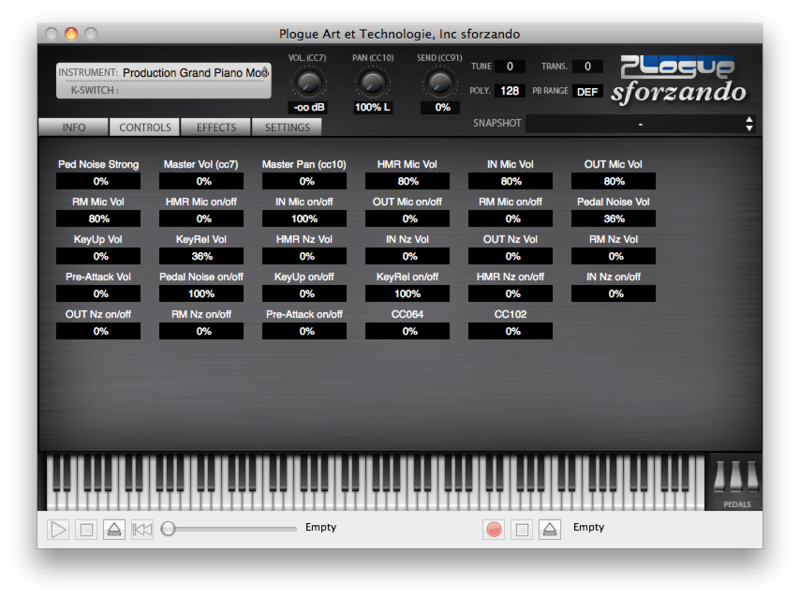 By contrast, Production Grand Modern sforzando has only the very basic user interface as part of the free Plogue sforzando player. Production Grand is delivered on USB 3.0 hard drive with a courtesy download of the Modern Silver Edition to get users started before the hard drive arrives while Production Grand Modern sforzando is delivered by download only. Production Grand Modern sforzando is essentially the the first half of Production Grand Gold. Specifications subject to change (with or without notice) as updates and improvements are made. PDF Production Grand User Manual This manual covers the full version of Production Grand for Kontakt. Production Grand Modern sforzando manual (PDF or video) coming soon.